Export diversification, which can be attained by changing the share of existing commodities (intensive margin) and including new commodities in the export portfolio (extensive margin), is needed to improve international competitiveness. In this study, we examine the significance of Turkeys intensive and extensive margins in the EU-15 market. Using SITC (Rev. 3) five-digit data from 1996 to 2006, we determine the extent to which the increase in Turkeys share in the EU-15 market results from a rise in existing exports or an increase in product varieties. We compare Turkey with its main non-EU-15 competitors in this market by applying the approaches developed by Feenstra and Kee (2007) and Amiti and Freund (2008). According to our analysis, for all competitors in the EU-15 market, the growth of exports has arisen primarily from the intensive margin, rather than the extensive one. Although a far greater portion of export growth is due to the intensive margin, rather than the extensive margin, Turkey has important opportunities to improve its export growth and competitiveness in the EU-15 market by increasing the production and exports of new products especially in research-intensive sectors. Key words: Turkey, European Union, export competitiveness, intensive margin, extensive margin. JEL Classification: F10, F14, F19. Uluslararası piyasalarda rekabet edebilirliği sağlamak için ülkelerin ihracatta çeşitlenmeye gitmesi gerekmektedir. İhracatta çeşitlenme hâlihazırda ihraç edilen malların paylarının artırılması (yoğun marj) ve yeni mallar ihraç edilmesi (yaygın marj) ile sağlanabilir. Bu çalışmada Türkiyenin AB-15 piyasasına yaptığı ihracattaki yoğun ve yaygın marjları 1996-2006 yılları için sayım yöntemi, Feenstra ve Kee (2007) ile Amiti ve Freund (2008) tarafından geliştirilen yöntemlerle incelenmiştir. Bu yöntemler her bir teknolojik sınıf için ayrı ayrı ele alınmış ve ayrıca Türkiyenin konumu AB-15 piyasasına ihracat yapan en önemli 30 AB-15 dışı ülke ile de kıyaslanmıştır. Çalışmamız, Türkiyenin yeni malların üretimi ve ihracatını arttırarak AB-15 piyasasında AB-15 dışı rakiplerine karşı rekabet gücünü arttırabilmesi için önemli fırsatları olduğunu ortaya çıkarmıştır. Anahtar Kelimeler: Türkiye, Avrupa Birliği, ihracat rekabet gücü, yoğun marj, yaygın marj. JEL Sınıflaması: F10, F14, F19. Agosin, M. (2007). Export Diversification and Growth in Emerging Economies. Working Paper wp 233, Department of Economics, University of Chile. Aldan, A. & ï¿½ulha, O. Y. (2013). 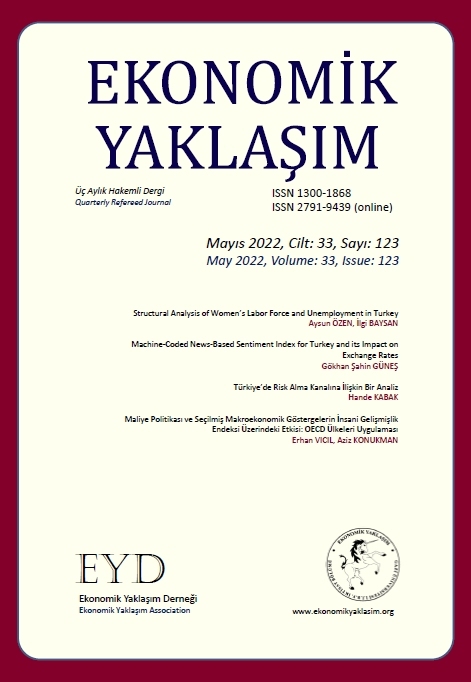 The Role of Extensive Margin in Exports of Turkey: A Comparative Analysis. Working Paper No. 13/3, Central Bank of the Republic of Turkey. Alvarez, R. & Claro, S. (2007). On the Sources of China's Export Growth. Working Paper No. 426,Central Bank of Chile. Amurgo-Pacheco, A. & Piï¿½rola, M. D. (2007). Patterns of export diversification in developing countries: intensive and extensive margins. HEI Working Paper No. 20. Erlat, G. (1999). Tï¿½rkDï¿½ï¿½Ticaretindeï¿½eï¿½itlenme. METU Studies in Development, 26 (3-4), 281-298. Erlat, G. & ï¿½ahin, B. (1998). Export Diversification in Turkey Over Time. METU Studies in Development, 25(1), 47-60. Erlat, G. & Erlat, H. (2003). Measuring intra-industry and marginal intra-industry trade: The case of Turkey, Emerging Markets Finance and Trade, 79(6), 5-38. Erlat, G. & Erlat, H. (2012). The Comparative Advantage of Turkish Exports vis-ï¿½-vis The European Union and OECD Countries, 1990-2000. EkonomikYaklaï¿½ï¿½m, 23 (ï¿½zelSayï¿½/Special Issue), 77-106. Evenett, S. J. & Venables, A. J. (2002). Export Growth by Developing Countries: Market Entry and Bilateral Trade Flows. Mimeo, CEPR European Research Workshop in International Trade, Munich. Feenstra, R. C. & Kee, H. L. (2004). Export Variety and Country Productivity. NBER Working Paper No. 10830, National Bureau of Economic Research. Funke, M. & Ruhwedel, R. (2001). Product Variety and Economic Growth: Empirical Evidence from the OECD Countries, IMF Staff Papers No. 48 (2), 225â42. Gourdon, J. (2010). FDI Flows and Export Diversification: Looking at Extensive and Intensive Margins. In J. R. Lï¿½pez-Cï¿½lix, P. Walkenhorst, and N. Diop (Eds. ), Trade Competitiveness of the Middle East and North Africa Policies for Export Diversification, World Bank, Washington, DC. Helpman, E., Melitz, M. & Rubinstein, Y. (2007). Estimating Trade Flows: Trading Partners and Trading Volumes. NBER Working Paper No.12927. Krugman, Paul R. (1980). Scale Economies, Product Differentiation, and the Pattern of Trade. American Economic Review, 70, 950-959. Yoshida, Y. (2008). Intra-Industry Trade Between Japan and Korea: Vertical Intra-Industry Trade, Fragmentation and Export Margins. Discussion Papers No. 32, Faculty of Economics, Kyushu Sangyo University. Cuadernos de EconomÃ­a 2017; 40(114): 208. Cuadernos de EconomÃ­a 2016; (): .